Cell. 2016 Dec; 167(7), p1705–1718.e13. Metformin has utility in cancer prevention and treatment, though the mechanisms for these effects remain elusive. Through genetic screening in C. elegans , we uncover two metformin response elements: the nuclear pore complex (NPC) and acyl-CoA dehydrogenase family member-10 (ACAD10). We demonstrate that biguanides inhibit growth by inhibiting mitochondrial respiratory capacity, which restrains transit of the RagA-RagC GTPase heterodimer through the NPC. Nuclear exclusion renders RagC incapable of gaining the GDP-bound state necessary to stimulate mTORC1. Biguanideinduced inactivation of mTORC1 subsequently inhibits growth through transcriptional induction of ACAD10. This ancient metformin response pathway is conserved from worms to humans. Both restricted nuclear pore transit and upregulation of ACAD10 are required for biguanides to reduce viability in melanoma and pancreatic cancer cells, and to extend C. elegans lifespan. 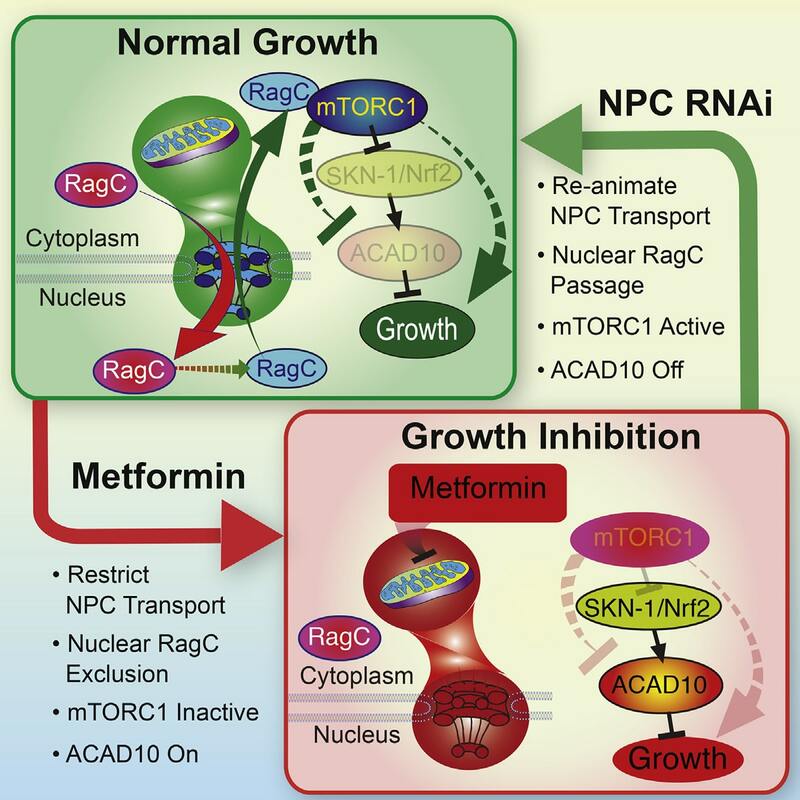 This pathway provides a unified mechanism by which metformin kills cancer cells and extends lifespan, and illuminates potential cancer targets.